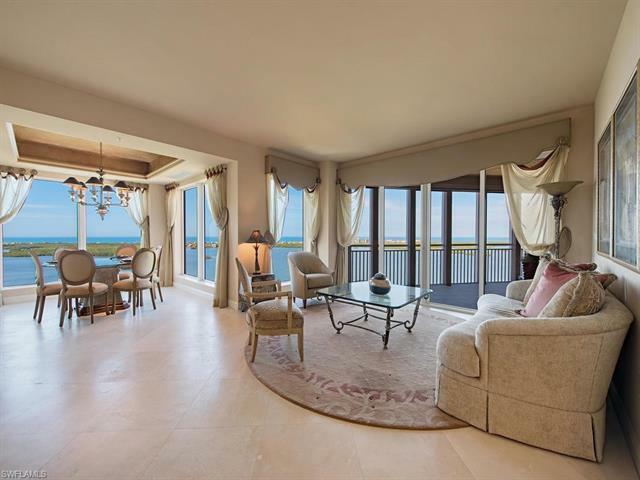 C.14791 - As you enter into Estancia #2103, you are greeted with a spectacular Panoramic view of the Gulf of Mexico and the inter coastal waterway. Previously a designer model and with âlightly usedâ furnishings make it perfect for the move in ready Buyer. There are two west-facing screened terraces and one open east facing terrace which allow outside access from every room. Estancia has updated common areas, a live-in manager, two guest suites, fitness center, massage room, club room, card room and a new pool deck in 2018 featuring a new pool, spa, fire pits, a covered social area with outside grilling, water feature and more. Bonita Bay, a gated community, welcomes owners to a complete luxury lifestyle. Bonita Bay has 5 golf courses, an 18 court tennis center, 4 restaurants, a new âLife Styleâ 18, 000 s/f fitness center, private beach, full service marina, 3 parks, 12 miles of biking/walk trails, and much more. Selling Office: Naples Realty Services, Inc.
© 2019, The data relating to real estate for sale on this Website come in part from the Broker Reciprocity Program (BR Program) of M.L.S. of Naples, Inc. Properties listed with brokerage firms other than Royal Shell Real Estate Inc are marked with the BR Program Icon or the BR House Icon and detailed information about them includes the name of the Listing Brokers. The properties displayed may not be all the properties available through the BR Program. BR data on this website is provided by Royal Shell Real Estate Inc on behalf of Deb Adams Bateman. The source of this real property information is the copyrighted and proprietary database compilation of the M.L.S. of Naples, Inc. Copyright 2006 M.L.S. of Naples, Inc. All rights reserved. The accuracy of this information is not warranted or guaranteed. This information should be independently verified if any person intends to engage in a transaction in reliance upon it. Data last updated 2019-04-23 07:08:04.